Working in the United Nations has always been any intellectual’s dream. Whether it is peacemaking or trafficking, most students aspire to work in the UN so that they can have a grand, successful career. If you are one of them, then give this article a good read. 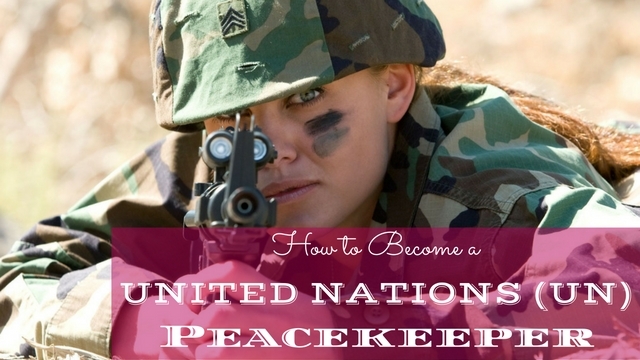 In today’s article we are going to tell you about how you can become a United Nations Peacekeeper within a few years. If you are a student and are hoping to be a part of this organization, the article is definitely going to benefit you. Keep reading to find out what it takes to be a part of the peacekeeping organization or department in the United Nations. The United Nations has been working towards the duty of peacemaking for years. They have helped in reducing environmental degradation, reduced chances of digression and also allowed impoverished areas develop their economies even more. The United Nations also have an ideal job for those who think they can work well. It is a major employer and offers several opportunities for career advancement as well. The competition is naturally very fierce but if you prepare a lot and have some luck already, you may actually get yourself a job in the UN. You must have enough experience and education so that you can qualify for the job of a peacemaker. Some of the requirements have been explained in this section below and tips on how to become a UN peacekeeper. You will be at a major benefit if you know several languages. French and English are two of them. Other languages include Russian, Chinese, Spanish and Arabic. It is helpful and needed in several positions these days. If you want to work in the peacemaking department, it is essential to have some kind of experience. Depending on the sort of experience you have, you will require around 1-7 years of such experience. So make sure you have that! You should have a bachelors degree if you want to make it big in the United Nations. There are a few lower level positions but that is called the general service category and is mostly for clerks. The sort of position that you are hoping for, needs you to have some kind of work experience. There are several positions that need you to be an expert in a certain area. You have to be the best if you want it. Next you must do a few online courses or courses in general if you want to become a part of the United Nations. If you can work in a non profit organization where you can help people with disabilities including women and children, that would be great. You could also take up an emergency response course where you can volunteer and take part in a few disaster relief efforts that will help you create a grand impression as well. Others include getting health related advocacy and education. You can step up your business management skills as well and help people in poverty stricken areas as UN volunteers. Volunteering is essential and could really help you get a UN peacekeeping job in the department. So keep trying! Next you must remember to do a proper and thorough research if you want to be a part of the United Nations, Doing enough research is really important. Go through the website and see all the kinds of work that is available in the United Nations. Before you really pick peacemaking, see what it is all about and the kind of work you will be expected to do. There are two official websites under the United Nations. You can check either of them and find help. The Young Professional Programme is usually for talented and young people who have little experience and would like to use that to learn more. People who are eligible may take an oral examination as well and determine if they are really qualified for the job. Those who are on the roster will be selected for the YPP jobs that are available. If you want to be a part of the YPP, you have to be around 32 years old or younger. You need to have a university degree and fluent in languages such as French and English. You also have to be a national of the country that is participating. If you consider yourself eligible, you can also go ahead and give a written examination that will last for 4 hours. There are two papers: one is a General Paper which is given to everyone who is appearing for the exam. A second paper is called the specialized paper which will help you test and understand the knowledge you have on the area you believe you are an expert in. If you are able to pass the test, you will be appearing for an oral examination as well. You should next attend the oral exam. See the sort of questions that are being asked. Only then you will realize the amount of preparation you need and what it really takes to land to UN jobs in the United Nations. You will also be contacted later if you are selected. Becoming the peacekeeper is not easy. You have to be educated, know plenty of languages, have enough skill and experience. Also you must have a good idea about the application procedure. In this post we have given you all the details that you need. If you have found the article beneficial and helpful, do let us know in the comment box below. We would love to get back to you. Till then, good luck.